"There are many ISO image files on my hard drive from my friends and I want to convert them to MP4 or MOV video format for playback on my computer and iPhone 6. Honestly, an ISO converter must be needed for converting. But thousands of programs on the market claim that they are experts in ISO file conversion. So, is there anyone can introduce me a useful and cost-effective program ASAP?" Without doubt, you may have come across the same puzzle as above. But, some people still have no idea about what is ISO image, not to mention converting ISO image to AVI, MP4, MOV etc. Actually, regarded as the image file for a DVD disc, ISO is short for International Organization for Standardization which contains all contents of the disc like menu navigation, the main movie, every single track and more. Commonly, the movie file can't be played on the majority of phones and tablets. As is known to all, supported video formats for majority of phones and tablets (iPhone, iPad, iPod, Android, etc) include: AVI, FLV, MOV, MKV, MP4，etc. Beyond question, everyone will feel so desperate when they found that the new releases on DVD saved in ISO image file can't play normally on handset or pad. So, what should they do for the sake of successfully streaming these files on mobile devices? Here is an advice: Anyhow, the wisest and fastest way is to convert ISO to MP4, AVI or other compatible video formats. That is to say, you need an awesome DVD ripper for Mac,which can aid you to effortlessly convert DVD or ISO image to popular video formats. 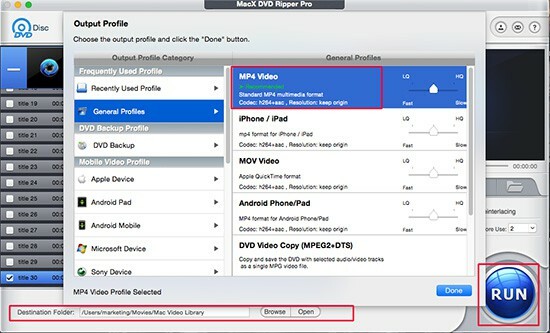 Hopefully, serving as a full-featured ISO converter, MacX DVD Ripper Pro can do the job and even enables you to directly copy and transfer ISO image to iPhone, iPad, iPod, Apple TV/3, Android etc with 36x faster speed and outstanding quality. Now, follow the below guidance below. Step 1: Free download and launch this DVD ripper on your Mac computer, click "DVD ISO" to import your ISO file on computer. If you are a Windows user, you are suggested to download the Windows version. Step 2: Select the output format as you want. Simply go "Mac General Video" from the drop-down box, choose "MP4 Video", "H264 Video", etc as output format and then hit the "Done" button. Step 3: Click the "Browse" button to specify an output folder on your Mac to save the output files. Step 4: Click the "RUN" button to start the process. It is true that the size of normal ISO file is almost 4-6GB which is the same to the original DVD. Even if you have transferred it to MP4 video file, the size of new video file is still so large that it will take up much space of your iPhone iPad. In order to free up space so as to store more media files, you are still required to compress iSO image file. 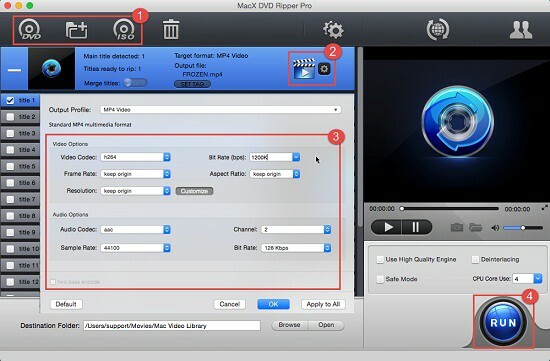 It is worth mentioning that MacX DVD Ripper Pro is also a practical ISO compressor, which is capable of adjusting the parameter setting for desired video file (video resolution, frame rate and bit rate) and trimming unwanted parts. Certainly, you can also choose converting and compressing ISO image to FLV or WMV, which is the ideal video format for video uploading with smallest possible file size compared with its siblings. By the way, if you are willing to watch your ISO or DVD on mobile devices, you can take advantage of MacX MediaTrans to transfer the converted or compressed ISO videos from computer to iPhone iPad straightly. Thanks to the built-in auto video conversion, the iPhone video transfer can convert ISO, MOV, AVI, MP4 to iPhone incompatibe formats during the transferring. As the saying goes, every corn has two sides. ISO image is still preferred by countless users. 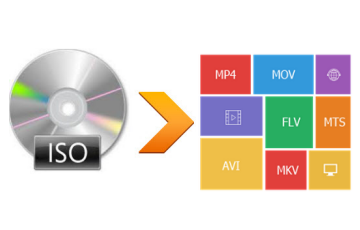 On one hand, ISO image file is the digital copy of DVD so that most of people prefer to store ISO image on computer hard drive rather than keep fragile physical DVD. On the other hand, ISO image, keeping the original structure of DVD and maintains DVD's menu, titles, chapters and more, is the only format supported by DVD so that it can be burned to another DVD directly. Anyway, MacX DVD Ripper Pro also offers you the easiest solution to copy DVD to ISO image. To be specific, this ISO creator can clone DVD to ISO image file with 1:1 ratio at fast speed by removing whatever copy protection tech, e.g., DVD CSS, region code, RCE, Sony ArccOS, UOPs, Disney, etc. To compress ISO image is not as hard as you imagine once you get the solid ISO compressor so that you can shrink ISO image to fit on 4.7GB CD, hard drive, DVD on Mac/Windows without much quality loss. Want to burn ISO to USB Type-C? Guide on how to write ISO to USB-C in 1:1 quality and with fast speed with the top USB ISO burner is shared to help you play DVD ISO movies on iPad, MacBook, Apple TV, or Surface Hub, Chromebook Pixel, etc. MacX DVD Ripper Pro is the best ISO converter to convert ISO to lots of digital formats on your Mac. It's a handy thing to have when you're trying to back up your DVD collection.